Kim & Chang won two awards at the prestigious 2018 IFLR Asia Awards, which were held in Hong Kong on March 1. For the 16th time, our firm was recognized as Korea’s top law firm. We received the newly renamed “Most Innovative National Law Firm of the Year” (South Korea) award, which recognizes one law firm per country for leading the way in innovation. Kim & Chang was also recognized for advising on Trafigura’s non-recourse commodity inventory funding program, which was named "Structured Finance and Securitisation Deals of the Year." 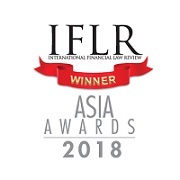 About IFLR Asia Awards: IFLR (International Financial Law Review), a finance law publication associated with Euromoney, annually hosts the IFLR Asia Awards. Based on submissions from law firms, interviews, and independent research, the awards recognize innovative law firms and cross-border deals in the Asia-Pacific region. This year, the awards ceremony took place at the Island Shangri-La Hotel in Hong Kong.